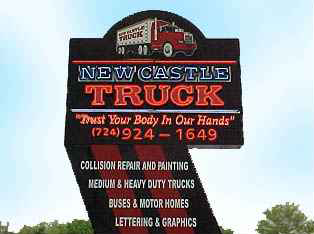 New Castle Truck & Trailer has been operating in the New Castle area for over a decade providing Quality and Timely collision repairs and painting. Our state-of-the-art painting and service facility offers the best equipment and highly trained technicians to handle most any workload. The services we offer range from collision repair and painting, to lettering and graphics. We service medium and heavy-duty trucks, as well as busses and motor homes. We also do custom lettering and graphics and installation of Reflex truck bed liners and Tommy Gate and Maxon lift gates.